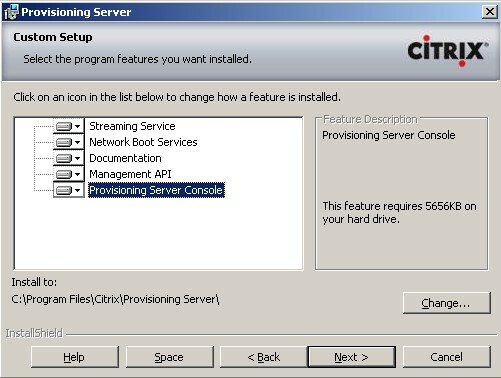 After the acquisition of Ardence by Citrix soon the second release of the OS streaming product nowadays called Citrix Provisioning Server will be available. As a CTP I already got the change to take a look at the non public beta 2 of the version labeled Citrix Provisioning Server 5. This version has a lot of improvements which I will describe shortly. After discussing the improvements I will show the new features improvements in practice by showing the installation, the configuration and the way working with this new version. The first change if you already have been working with Ardence/Citrix Provisioning Server is the conversion to a Microsoft Management Console instead. A logical step because all Citrix products are migrating to the Microsoft Management Console. It is also possible to start the MMC using the Remote Administration possibilities. Probably one of the most requested improvement in the software is the possibility to create a hierarchy within the console. Version 5 has the following components Farms, Sites and Device Collections available. a server running the PXE service. Because on farm level the same database, shared storage and PXE services are running it's the sites are more a logical separation than this can be used for more geographical locations. Sites represent and manage logical groupings of Provisioning Servers, Device Collections, and site-specific stores. Device Collections simplifies device management by performing actions at the collection level rather than at the target device level. In combination with the new hierarchy Citrix Provisioning Server offers delegation of Control within the console. Within the console Windows/Active Directory groups can be added in four roles named: Farm Administrator, Site Administrator, Device Administrator and Device Operator. Also the integration with Active Directory has been improved (local built-in users and groups). With the view component you can create logical grouping of devices despite of their location into site or device collections. With version 5 there will be a 64 bit version of the server installation. Just like all Citrix virtualization products Citrix Provisioning Server will be using the Microsoft Virtual Hard Disk format (VHD). More information is displayed about the devices connected like name, IP address, MAC address, status, current server assignment and current vDisk assignment. Besides the PXE boot devices can now also be started using the Boot Device Management utility from a hard disk, USB drive or cd-rom (was already available in version 4.5). Till now a simple access database was used for storing the information. Citrix Provisioning Server 5 will also support all versions of MS SQL server 2005. Upgrading to a new version of Ardence was removing the software and re-installing the software again (and often also rebuilding the vDisks). With Provision Server 5 there are now several improved upgrades paths. Citrix Provisioning Server 5 has .Net Framework 3 has a prerequisite for the server part. 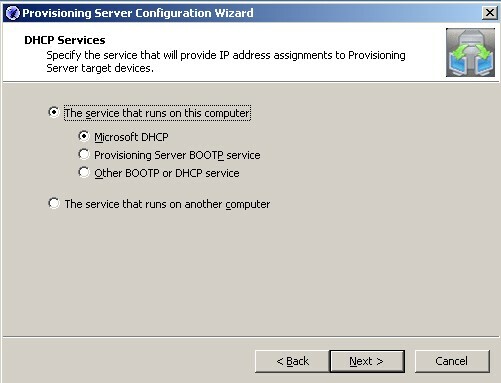 Also Citrix Provisioning Server 5 is using an updated Citrix Licensing Server (the same version as XenApp 5). The installations of the several components are available as separate executables for server-, client- and console installation (all three available as 32bit and 64 bit). The installation of the server part is (still) pretty easy. Just accepting the license agreement, specifying the destination locations and choosing the installed components and the product is installed. In this beta (and previous versions) below displayed message will pop-up, because the drivers are not signed. In the final version Citrix told me that the drivers will be WHQL certified, so these messages will disappear. 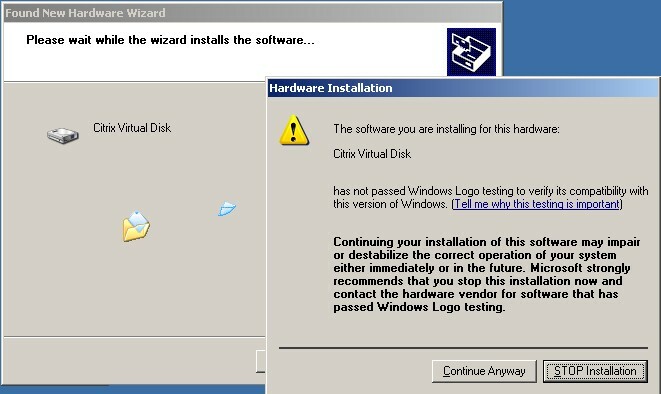 When the software is installed a reboot is required for those devices, but on the other hand a wizard will be displayed for configuring as in previous versions with the configuration of DHCP, TFTP and PXE services and the new hierarchy is visible by specifying to create a new farm or join an existing. On a management server or client machine you can install the console separately to remote administrator the Provisioning Server(s). The client installation for creating the vDisk image is (just as the installation of the server component) not changed a lot and has less configuration options. Just like the server you need to allow the installation of the drivers. As already mentioned the console has been changed to a Microsoft Management Console with a hierarchy. The first time you start the console you need to specify one of the Provisioning Servers in the farm to connect to the farm. You will see definitely see the difference (for sure in the final version where the console icons will be even smoother than in this beta review). First of all you need to create you can now have the possibility to create more locations to store the vDisks. Such a store can be assigned to a Site and specific Provisioning Servers. Creating the vDisk is similar with the previous version, but the properties are changed a bit. The biggest change on vDisk level is the VHD format. Beside the interchangeable format with other product, the biggest advantage is that is possible to configure a vDisk to grow dynamically (thus starting with a very small disk). It's easier to choose the vDisk should be accessed (directly or using the HA load balancing algorithm). If you choose the Edit file properties button all vDisk properties will be displayed as you are used to including the option to enable Active Directory machine account password policy, HA, setting the version numbering and so on. Next you can specify additional sites for separation and delegation of control. Per site you can specify other administrators. In a site you can create several Device Collections for a logical separation of the devices. One of my wishes is embedded within the device collection options. You can specify a template target device. The settings of this device will be automatically set to a device which you add to this device collection. On the collection device you can specify also the device administrators and operators. 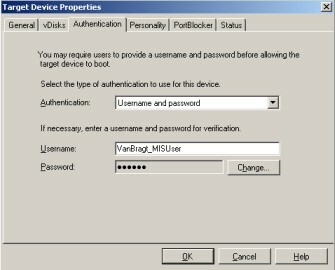 Within the device collection menu several options are available like creating a device, managing a device (reboot, startup, shutdown, send message) and Active Directory machine accounts. The properties of a device are not pretty similar (displayed) in comparison with the previous versions. One new feature is the possibility to set a username and password that need to be specified to startup the vDisk. This can be useful to start-up for example a disk for specific users or the Master Image Server. Also the servers are stored per site. It is now easy to determine their current state. Also on server level you can specify the stores which can be used by the server. Furthermore the same options are available as in the previous versions. The process of building a vDisk image is exactly the same as in previous version. You install a server on similar hardware and at the end you install the client software. When the software is installed you should add the server into the console, add a (private) vDisk en set the boot option to hard disk. The Provisioning Server Image Builder has no new options and also the presentation is exactly the same. In Citrix Provisioning Server 5 the same types of vDisks are available: a private image (single device/read and write) and a standard image (multiple devices/read only with write cache). After building the image and changing the type of image (and activation active directory support) the vDisk can be assigned to devices. Nothing is change to that, just like the update mechanism (automatically assign a new vDisk with updates) is working exactly the same. When you have worked (just as me) with the original Ardence product and the supplied the documentation you will be very happy with the new documentation. In the Ardence documentation mostly all content was available but much unstructured. The Provisioning Server 5 documentation is as usual from Citrix really organized and easy to navigate. Citrix also told me that the documentation is still not on the desired level and will be improved during the time. The big step made in the Citrix Provision Server 5 version is the scalability and manageability of the product for larger organizations with the new console with a hierarchy in combination with the possibility of delegation of control. Beside several technical features are implemented which were high on the wishlist of additions to the product like the device template and the dynamically disk size. Ofcourse there are also some options where we are still waiting on like offline usage of vDisks, but this new version is a big step forwards. So I can really recommend upgrading to this version. PS: The final release will have even smoother icons in the console as shown in the figure below.